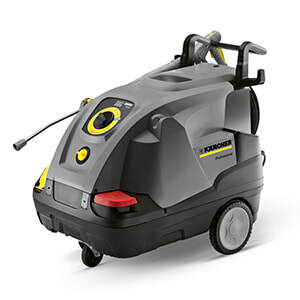 A light weight, durable and compact cold water pressure washer that offers ultimate mobility for on-site applications and is designed to be stored, transported and operated in the vertical and horizontal position. It’s features include a reliable 3-piston axial-pump with a brass cylinder head, an automatic pressure relief system for protecting the pump and storage options for accessories. This unit is certified to UL and CSA safety standards. A compact cold water pressure washer offers maximum portability, maneuverability and smart features. It can be stored, transported and operated in the vertical and horizontal position, and at 55.6 lbs, this professionally built unit can easily be moved by one person in and out of vehicles and around a cleaning site. It also includes storage options for accessories, and is certified to UL1776 safety standards. Designed to take the heat, accepting incoming water of up to 180°F, making it ideal for kitchen and food service applications. Its compact design and portability make it convenient for fast cleanups while its commercial- duty components make it tough enough for all cleaning jobs. Non-marking hose and wheels leave no traces behind; rugged 3-piston commercial axial pump ensures long service life; total trigger shutoff saves energy; and protective cover shields components from overspray. This unit is ETL safety certified to rugged CSA and UL standards.